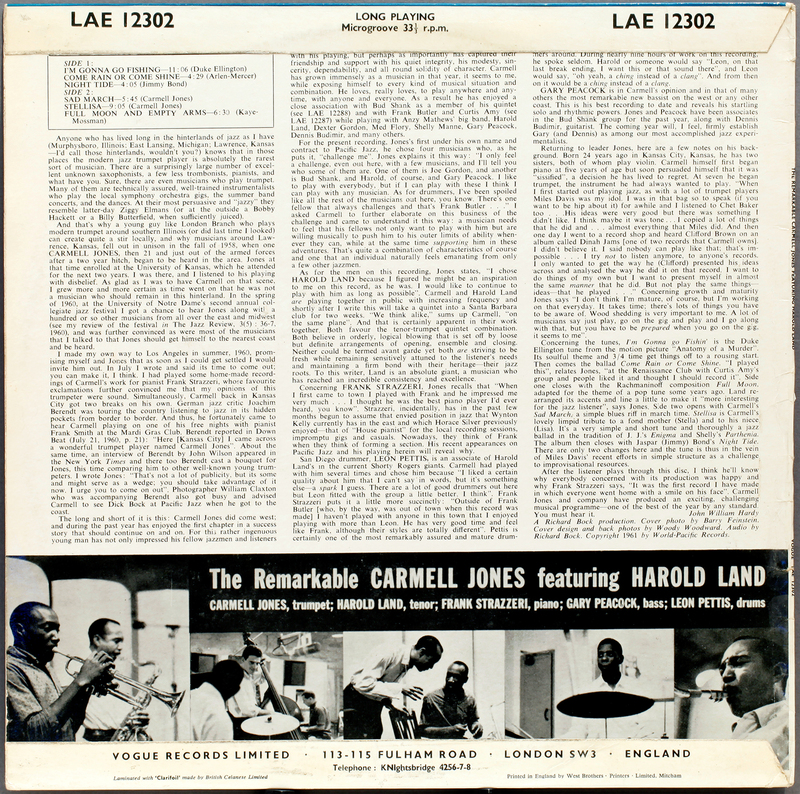 Carmell Jones (t) Harold Land (ts) Frank Strazzeri (p) Gary Peacock (b) Leon Pettis (d) Producer/Engineer Richard Bock (founder of Pacific Jazz) June 1961 Los Angeles, CA. Jones was born and educated in Kansas, studied trumpet, and moved to work in Hollywood recording studios. He went on to tour with Horace Silver, and his best known appearance is on Silver’s signature “Song for my Father” in 1965. Another US jazz émigré, he moved at the height of his career to Germany for 15 years, working on the German jazz scene – Radio Free Berlin – playing at International Festivals with the likes of Pony Poindexter, Oliver Nelson and suprisingly, Jean Luc Ponty. He returned to the US in 1980, however by then the music scene had moved on and he retreated into obscurity, his initial promise never realised. A good bop outing to which Land adds his customary piquancy on tenor. A young Gary Peacock’s presence adds a particular note of interest. An acoustic bass player of outstanding career longevity, Peacock has appearing most recently on the stage of the London Jazz Festival 2011 with Keith Jarrett and Jack DeJohnette, still going strong. 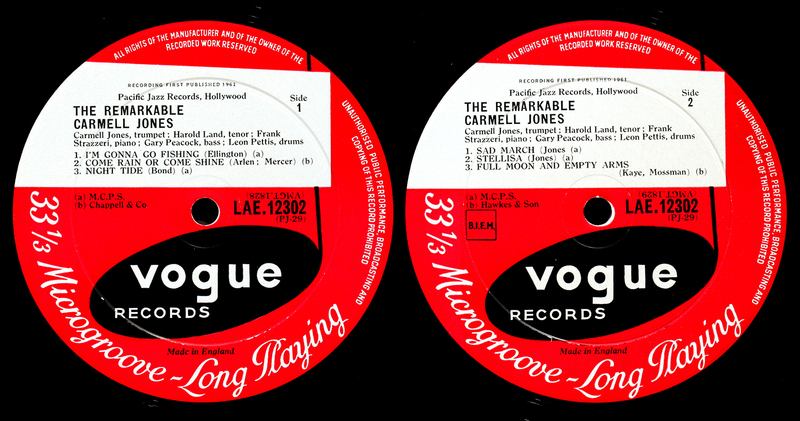 Released originally on the US West Coast Pacific Jazz label rarely seen in the UK, found here on UK Vogue. Commonplace as a reissue in the 1980’s on Affinity/ Charley Records, the original Vogue release is characteristically heavy vinyl early Sixties pressing by Decca, with the 1B Matrix indicating original UK first pressing, sound to match. Came across this in a London store and was attracted to the Harold Land presence and the fact I like original UK pressings from the fifties and sixties, and the fact I hadn’t seen any records I fancied all day. I probably paid a bit too much for it, but sometimes you do. It makes up for all the bargains for which you pay to little. 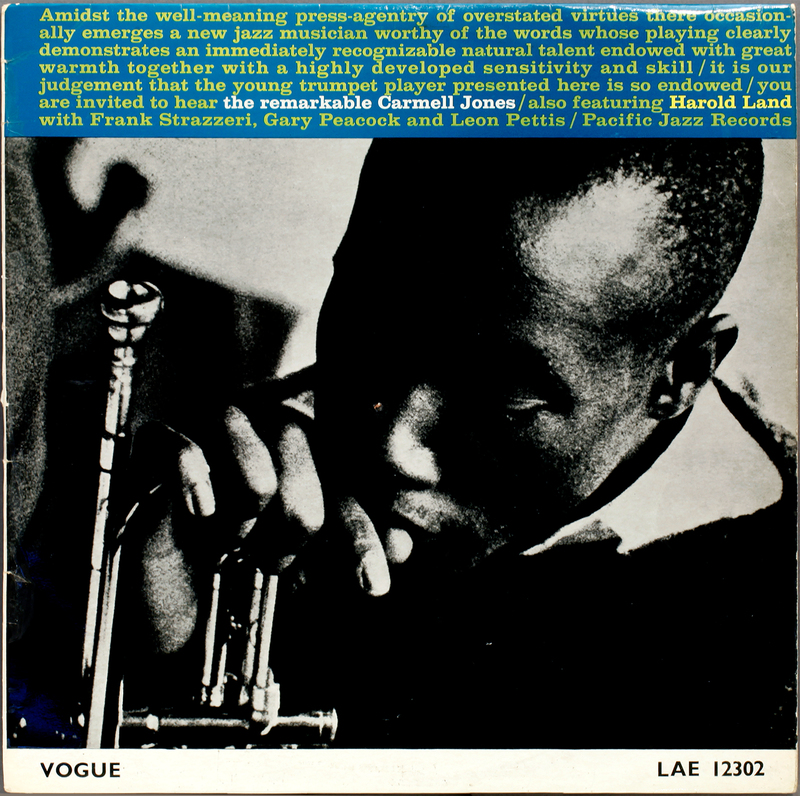 This entry was posted in Contemporary, Harold Land, Vogue and tagged Carmell Jones, Contemporary, Frank Strazzeri, Gary Peacock, Harold Land, Leon Pettis, Vogue by LondonJazzCollector. Bookmark the permalink. Oh boy, would they all bid each other to death, if this record would have been released on Blue Note. Jones/Land. One of the tightest front lines you could get. It always intrigues me when I read “…retreated into obscurity…” -It happened to so many other superb artists from those days. The two cuts are a joy to listen to and especially the ballad reminds me of Thad Jones’ style a bit. wow !!! i have never heard of this album !! !